Having checked on the hives a beekeeper in the Midwest has an idea of how many have survived the Winter. With some cold weather still to come it isn't certain that the hives that were healthy in February will still be viable by the time of the first nectar flow. So a beekeeper has to make an estimate of how many hives will need to be replaced. How does a beekeeper get new bees? Most beekeepers will get bees one of two ways. They can buy what are called package bees. These are bees that are collected from other hives and put into a screened box. Once about 2 or 3 pounds of bees are in the box, a small wooden cage is included inside. It holds a queen bee which was raised in a separate hive. She is put in a cage for her own protection. Having just come from the hive they were raised in and being familiar with the queen from that hive, these bees need time to get used to the new queen. Until then, they are as likely to kill her as to take care of her. Once the queen cage is inside, a can of sugar syrup is inserted into the top. It has tiny holes in the bottom which will let the bees feed during their trip to a new hive. Packages of bees like the ones in the picture are shipped from southern states and California to beekeepers all over the country. A hobby beekeeper with one or two hives can get packages sent through the mail. 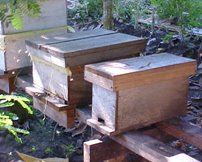 The second way to get bees is by buying what is called a nucleus hive or"nuc". I pronounce it "nuke" some people pronounce it "nook". It is a half size version of a regular hive with a queen that has been accepted by the bees and has started laying eggs. Nucs are typically available closer to home for a beekeeper. A lot of hobby or small business beekeepers will raise nucs to sell to other local beekeepers. Which brings me to a third way a beekeeper can get bees. That is to raise queens and start their own nucleus hives. That is what we at Chicago Honey Co-op are going to begin to do this year. We don't think that ordering packages of bees every year is very sustainable. We want to invest in raising our own bees so that we can not only avoid the cost of having bees shipped across country to us but develop bees that are hardy in winter and good honey producers. Bees that we can use ourselves and make available to local beekeepers here.